Looking to become the next popular franchise with teens on the big screen is the popular young adult book Mortal Instruments: City of Bones by Cassandra Clare. The Karate Kid remake director Harald Zwart is at the helm of the story which sees Lily Colllins (The Blind Side, Priest) playing a young woman who discovers she is the descendant of a secret cadre of half-angel warriors called Shadowhunters locked in an ancient battle to protect the world from demons. 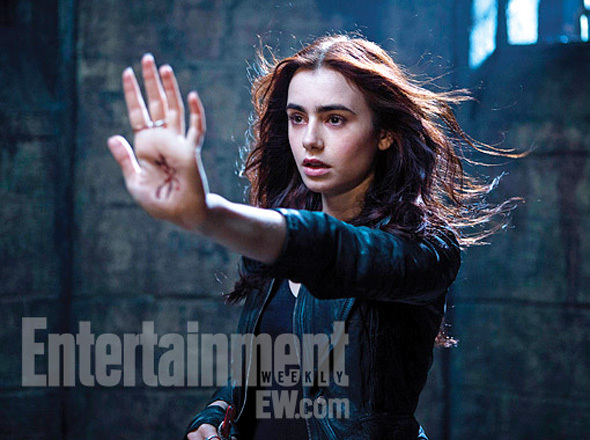 Now we have our first look at Collins as the lead character doing something with a bloody rune on her hands (fans probably know what's she's doing). Look! Harald Zwart (The Karate Kid, Agent Cody Banks) directs Mortal Instruments: City of Bones written by I. Marlene King and Jessica Postigo and based on Cassandra Clare's book of the same name. Lily Collins (The Blind Side, Priest) plays Clary Fray, a young woman who discovers she is the descendant of a secret cadre of half-angel warriors called Shadowhunters locked in an ancient battle to protect the world from demons. Jonathan Rhys-Meyers, Jared Harris, Kevin Durand, Lena Headey and Kevin Zegers. Sony's Screen Gems arm will release the film late next summer on August 23rd, 2013. Any fans interested?